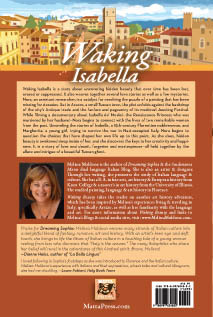 Waking Isabella is a story about uncovering hidden beauty that over time has been lost, erased or suppressed. It also weaves together several love stories as well as a few mysteries. Nora, an assistant researcher, is a catalyst for resolving the puzzle of a painting that has been missing for decades. Set in Arezzo, a small Tuscan town, the plot unfolds against the backdrop of the city’s Antique trade and the fanfare and pageantry of its medieval Jousting Festival. While filming a documentary about Isabella de’ Medici—the Renaissance Princess who was murdered by her husband—Nora begins to connect with the lives of two remarkable women from the past. Unraveling the stories of Isabella, a 15th-century Florentine noblewoman, and Margherita, a young girl, trying to survive the war in Nazi-occupied Italy, Nora begins to question the choices that have shaped her own life up to this point. As she does, hidden beauty is awakened deep inside of her, and she discovers the keys to her creativity and happiness. It is a story of love and deceit, forgeries and masterpieces—all held together by the allure and intrigue of a beautiful Tuscan ghost. 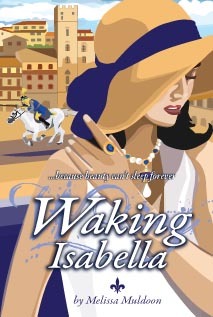 All in all, I would say “Waking Isabella” by Melissa Muldoon is a must-read for all fans of Italy, history, romance and intrigue. Eccellente! Laura Fabiani Review — Italy Book Tours: “Waking Isabella” is a tale of reawakening one’s true potential and joy in life found in the beauty of art and strong women who have shaped the past. Renaissance princess Isabella de’ Medici steals the limelight as her influence transforms lives even across centuries. A beautiful story filled with intrigue, mystery, art, and redemption, Melissa Muldoon succeeds in transporting the reader to Tuscany with all its cultural festivities, history and people. A treat for lovers of historical fiction, the beauty of art, and the challenge of starting a new life and rediscovering love.